Synopsis: Set in 1930's San Francisco, an old Tonto (Depp) regales a kid with the tale of The Lone Ranger - a former lawyer named John Reid (Hammer) who heads home to Texas to join his Ranger brother, Dan (Dale). While tracking down escaped criminal Butch Cavendish (Fichtner), John, his brother and his rangers are ambushed, killing everyone. John is brought back from the dead by Tonto, rechristened The Lone Ranger, and they team up to carry out the task of catching Cavendish, but wind up discovering a deeper plot involving the Transcontinental Railroad and railroad tycoon Latham Cole (Wilkinson). Andrew: Hello readers! 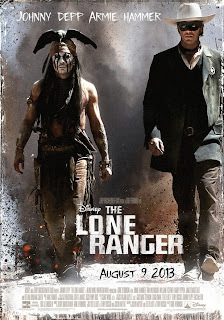 Continuing our task of catching up on reviews we’ve been late on posting, today Sarah and I are discussing this month’s big blockbuster, and utter box-office flop, The Lone Ranger starring Johnny Depp as Tonto and Armie Hammer (The Social Network) in the title role. The Lone Ranger is a bit of a reuniting of the crew that brought us the hugely successful original three Pirates of the Caribbean movies, particularly with Depp and director Gore Verbinski coming together again after Verbinski sat out Pirates of the Caribbean: On Stranger Tides. So this was Disney’s big film of the summer, hoping that this group of people could put together another successful franchise based on the old radio and television show. Sarah, now that we’ve seen The Lone Ranger, what did you think of this new attempt at a franchise? Sarah: I thought that it was a feast for the senses, but that’s about it. It was action-packed and it was the Johnny Depp Show to the max, but as far as storyline? And character development? I thought it was incredibly weak. What did you think? A: Well, I think you’re right, that’s it’s totally full of action, especially the last half of the film. But, yeah, the storyline isn’t the strongest and I understand they had to kind of set this up; it’s really starting from scratch pretty much as they’re trying to market this to an audience and a generation that doesn’t really know the Lone Ranger, or even care about the Lone Ranger. A: This is like what my grandfather listened to on the radio when he was a kid. S: So it’s from a by-gone era and isn’t really relevant anymore. A: And if there’s something that we’ve learned over the last decade or so, it’s that cowboy movies and Westerns aren’t as popular as they used to be. Wild Wild West was a bit of a flop, which this one will be compared to a lot I think. And I’m kind of blanking on the names of other Western films, but I think that supports my point. I’d say the last really successful Western film was True Grit, and that’s only if you don’t consider Django Unchained a true Western film. S: This one kind of harkens back to John Wayne-type films, again, a by-gone era. I applaud Disney for trying to reignite a once popular genre of film, but I think this one missed the mark. I felt like it was Pirates of the Caribbean set in the Old West. A: To be fair I think that’s exactly what they were going for, though. S: Right, but I think that’s a shame. They’re hoping to make another Pirates franchise and I think Disney’s just become too hungry. This is their thought of “How can we make easy money? Oh we’ll just reignite the Lone Ranger and see if that takes off.” I thought this would be a flop after we saw it and it turns out that it has been. S: It was all OVER the place is what it was! A: Here’s my main problem with it: it’s far too bloated. It’s overly long, they try to pack in a lot of stuff, like what was the Lone Ranger’s real name? S: I don’t know…you’re right, “bloated” is the perfect word for this movie. They fit in…it was a waste of talent if you ask me. This film was way too bloated with famous people, too, if you ask me. I didn’t understand Helena Bonham Carter’s appearance in the film at all except to add some color. That’s really the whole reason she was here. She’s in two scenes where she has any lines. Two scenes! And I think that was a waste of her talent and time, really. I think the guy who played the captain of the cavalry? S: Yeah, why did he have to be someone famous? A: Well you have to remember, babe, that these are actors! They’re all going to be relatively famous in one way or the other. S: I know, but they just kept adding characters and layers of plot on top of layers, especially with the bad guys. A: And that’s what I mean by bloated. They try to give a mythology to the primary villain, Butch Cavendish (played by William Fichtner), and then there’s the railroad track being built and the silver mining going on, then we finally get his backstory and there’s a whole lot going on. S: It’s very much a Princess Bride storytelling device. A: Exactly. And that was wholly unnecessary. S: Wholly unnecessary! But it gave Johnny some more screen time. A: It did, but it just didn’t work for me. The only think I liked about the storytelling device was in the last act, some things kind of come back around, like they Tarantino it a little bit, so things like that made for cool little reveals. A: But I was bored and just didn’t care about their characters and didn’t care for their characterization of their characters. I just didn’t find Depp’s Tonto to be funny at all. So I was bored with it for a very long time. S: I thought it was a bit of a shame that it was so…it tried so hard to be funny, then it tried to give it heart, but I never fully bought either thing. And I think if you can’t catch your audience on at least one side of a feeling towards a movie, then you’ve lost them completely. The audience laughed at times, but not in the whole-hearted, “Oh my gosh this is so new and so funny!” way that you’d want. It’s recycled material. It was Johnny Depp with an Indian accent. It was a shame. And I feel bad because Armie Hammer isn’t even top-billed and it’s his story! But I guess it’s been marketed from the beginning that it wasn’t about him, that it was about Tonto, which I also think was a shame because it’s not Tonto’s story. A: And from a marketing perspective, how could they market this to a broader audience? Are you going to market it to these kids who don’t give a crap who the Lone Ranger is? Or are you going to market it as Johnny Depp playing another wacky, funny character? S: That’s true. Johnny Depp playing Jack Sparrow in Indian garb. A: Exactly. So here’s my thing though: So I was bored with it for big long stretches, but I have to give it credit that the last act – with the mines and the train chase – I really, really actually enjoyed. S: That’s what reminded the audience that this was a Lone Ranger movie! The music! I was waiting the whole time for it. Usually they might fit in a theme song here or there, or a small snippet of it into some other music, but no – Hans Zimmer waited until the very last act to bring it in, and then the music was just the William Tell Overture. It wasn’t anything else. A: It was the Lone Ranger! S: It was definitely the Lone Ranger at the end. A: Over a very extended action piece, but not only did the music fit perfectly, I thought the action sequences were done very well in the last act because I felt like it was shot very much like a scene from Pirates of the Caribbean. It made me remember that Gore Verbinski is actually very good at directing this big action sequences! A: It was very reminiscent of the Pirates films, and at a number of times in the climax I had a big grin on my face because I was getting into it. Like, “This is what I’ve been waiting almost two hours for!” If this could have been much sooner, I think the film would’ve been better as a whole. A: The film definitely ended strong. As we were walking out of the theatre I was feeling really good about the movie because the last act almost made me forget everything that came before it. S: Right. And that’s the thing, too, that it is an origin story. So it wouldn’t have made sense to use the theme early on, because he wasn’t the Lone Ranger just yet. A: Yeah, I mean for as much as we didn’t enjoy most of the movie and the first two-thirds were boring, I liked that they saved the theme until the end. I think the problem was that the film is way too long and they should have streamlined this. So I liked the ending and if they make another Lone Ranger movie I hope it’s more along the lines of how this one ended, because that was actually fun. S: And it pays more homage to the original versions of the characters. I’m sure they’ll be a second one despite the bad box office. A: Now, before we wrap this up, here’s something that bugged me: the bad guy, Butch Cavendish? I know from when they first were trying to make this movie years ago…The Lone Ranger went through a lot of script problems and budget problems, and the thing was…it was reported that the original script had a lot of mysticism in it, almost like Indian magic going on, but there were also supposedly going to be werewolves in it. And there is still some of that DNA in the final film with Cavendish, because repeatedly people are calling him a wendigo, which is a demonic creature of sorts. S: And then they just drop it. A: Exactly, except they keep calling him wendigo. S: Then they switch and call the 2nd villain a wendigo! That’s what confused me and lost me. Like, who’s the real bad guy here? A: So I just found it interesting how they kept some of the cannibalism in there and then dropped it completely. I didn’t understand that part. Small potatoes, but it was something that bugged me. S: No, it’s not small potatoes. That’s something that drove me crazy. I hated it because that was one of the layers upon layers of things that bothered me. Like, they alluded to it with Helena Bonham Carter’s character and her leg, which was weird, then they dropped it and it didn’t make sense to me. All in all though, I think it’s a fun action movie to take the kids to see on a hot summer weekend day, but other than that? Break out the Pirates movies because I think you’ll get more entertainment out of those. S: And we like Armie! But yeah, it’s a disappointment. S: And we didn’t go into this with high hopes at all and it still disappointed us. Let’s leave it at that.